Clammy Locust (Robinia sp), Cross Vine (Bignonia capreolata), Dame's Rocket (Hesperis sp. ), Fleabanes (Erigeron spp. ), Mock Orange (Philadelphus) Iris (Iris spp. ), Roses (Rosa spp. ), Peony (Paeonia spp.) Princess Tree (Paulownia tomentosa), Privet (Ligustrum spp. ), Golden Banner (Thermopsis) and Wild Black Cherry (Prunus serotina) are some of the many things blooming well right now around Asheville. The Princess/Empress tree has a fascinating story from its name both botanical and common, its use in dowries, and its alluring flowers. It was formerly placed taxonomically in the Scrophulariaceae but now it is put in its own family with a couple other genera in the Paulowniaceae (Group, 2009; Haston, Richardson, Stevens, Chase, & Harris, 2009). What plants around you are in flower or fruit? Include a few down below in the commentary section if you get a chance. Make a bouquet for someone you love and one for yourself too! 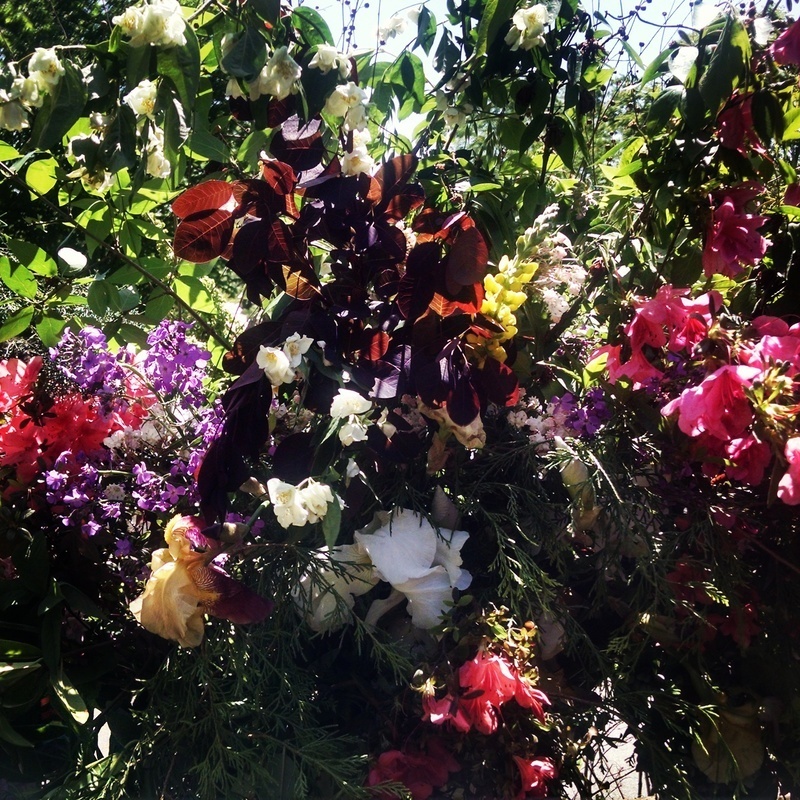 Think, colors, heights, textures, smells….Some flowers hold up better than others. Members of the Brassicaceae, Poaceae and Asteraceae are particularly good choices. For the last 11 years i have done the flowers for the Warren Wilson College graduation stage along with my friend and mentor Michael Gentry as i mentioned in the last class. You can see an example of one of our arrangements from this year in the pictures above. Botany in a Day Pages 25-36 6th ed. 27-36 5th ed. Using keys can be downright intimidating to some and at least a bit tricky to get a hang of for many. Organizing your thoughts in a systematic logical progression is essential. Pages 25 (5th ed.) and 23 (6th ed.) offer a basic tutorial. The monocots and dicots are a big separation amongst the flowering plants. The monocots have their own key on page 36 (5th ed.) pgs. 34-35 (6th ed.). We discussed the differences in the last class and they can be revisited on pg. 14 (5th ed.) or pg. 15 (6th ed.). Next to the monocot key is a useful key to woody plants by their fruits. The trees and shrubs are a very accessible group to get to know as most areas have them in the tens versus lower growing (herbaceous) plants by the hundreds or thousands. Understanding the terms covered in both inside covers and on page 26 (5th ed.) and 24 (6th ed.) is essential to going deep with your exploration of botany. However, much enjoyment can come from looking at the major patterns illustrated along pages 27-36 (5th ed.) and 25-35 (6th ed.). Not too many wild plants fit in this group and many of them are succulent or aquatic. The Ranunculaceae is a notable exception. Sometimes the members of this family only have sepals that look like petals. This is an uncommon pattern as you may recall. Typically monocots have parts in 3 and 6s not dicots. This is mostly a primitive characteristic seen in the Magnolia (Magnoliaceae), Bay Laurel (Lauraceae), PawPaw (Annonaceae), and Barberry (Berberidaceae) families amongst others regarding dicots. It makes sense for those who have the 6th ed. when you look at the plant family tree of evolution on page 16. Members of the Heath Family (Ericaceae) blooming now often have their petals fused into an “urn” like shape. Great examples not yet mentioned include Doghobble (Leucothoe spp. ), Pipsissewa (Chimaphila spp.). The Evening Primrose (Onagraceae), Loosestrife (Lythraceae) and Hydrangea families (Hydrangeaceae) tend to bloom later in the spring and more in the summer while the Gentianaceae tends to bloom in the fall. The Olive family (Oleaceae) is the most prominent woody group in the temperate zone of the U.S. with four petals. It tends to contain representatives here with fragrant white and sometimes blue petals. Some examples include Ash (Fraxinus spp. ), Fringe Tree (Chionanthus spp. ), Lilac (Syringa spp. ), and Jasmine (Jasminum spp.) and the aforementioned Privet. The Autumn Olive family Elaeagnaceae also has four petals with fragrant flowers and members that can tend to be invasive at times. One distinction is that the Elaeagnaceae tend to have silver colored undersides to their leaves. Many of these plants with tubular flowers have distinct inflorescences that make it easy to place them in a family. Phlox in the Polemoniaceae are an excellent example that are or will be blooming soon in many locales. Members of the Borage family (Boraginaceae) that now includes the Waterleaf family (Hydrophyllaceae) are other examples currently blooming. This is by far the most common pattern as can be seen from all the illustrations on page 33 (5th ed.) and 31 (6th ed.). Thus it will take the longest to learn and distinguish. Flowers are by far the easiest way to determine a plant. But, the goal overtime is to build a portfolio of characteristics including growth habit, leaf orientation, leaf form, leaf edge, color, hairiness, smell, fruit characteristics, bark, sap, ecotype etc. For the next class we will cover other major mostly non-woody temperate cultivated food plants it will be posted in just over a week around June 6th. - Read the entries in Botany in a Day and the site here on the 7/8 major families discussed last time if you have not already. - Begin to make a photo album of a certain nature spot while the seasons progress. Praises to all that have donated to the cause! i encourage everyone to donate as they are able financially, commentarily, or energetically... Your contributions greatly help me continue this crucial work of ethnobotanical research and education. Please let me know your thoughts in general and anyway i can help this class serve you best.